As the Muslim Caliphates expanded their territory across eastern Europe, northern Africa, Spain and many isles in the Mediterranean, the Christian world was seeing its territories fall, one after the other. 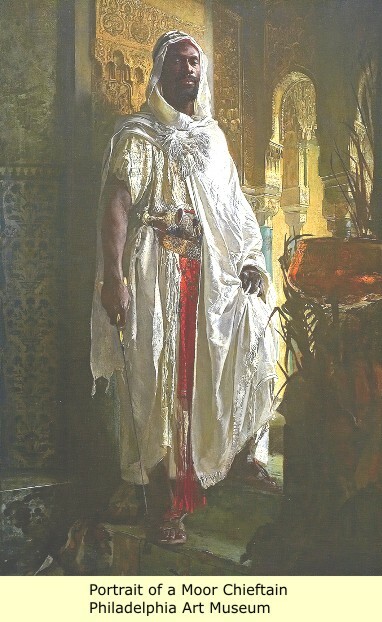 The third Islamic caliphate, the Abbasid Caliphate (A.D. 750-1298), saw the Muslim Moors cross into Spain and conquer it. A turning point in western attitudes towards the east came in the year 1009, when the Fatimid caliph of Cairo, al-Hakim bi-Amr Allah, had the Church of the Holy Sepulcher in Jerusalem destroyed. His successor permitted the Byzantine Empire to rebuild it under stringent circumstances, and pilgrimage was again permitted, but many stories began to be circulated in the West about the cruelty of Muslims toward Christian pilgrims; these rumors then played an important role in the development of the crusades later in the century. By 1095, Islamic Caliphates had waged nearly 600 offensive campaigns into Christian territory (Holy Land and Northern Africa and Portugal and Spain and Byzantine Empire). Now the south of France was being attacked by Islamic soldiers. In 1057, Sicilian Muslims attacked the southern “boot” of Italy. In 1063, Pope Alexander II gave blessing to Spanish Christian soldiers to fight off the Muslim Moors. This ushered in the famed Reconquista of Spain in which Christian soldiers fought back the Islamic caliphate out of Spain and Portugal. The Byzantine Empire at the time was Greek Orthodox Pope Alexius I’s territory. He pleaded with Catholic Pope Urban II for help against advancing Muslim armies which were over running his territory. St Augustine of Hippo, back in 4th and 5th century had argued in favour of a “Just War” theory. This had been controversial with Popes but was now being studied closely as formerly Christian lands (i.e. : Byzantine region, northern Africa, etc) were being swallowed up by the growing Muslim empire. November 27, 1095 – Pope Urban II’s “Crusade sermon” which launched the Crusader era. 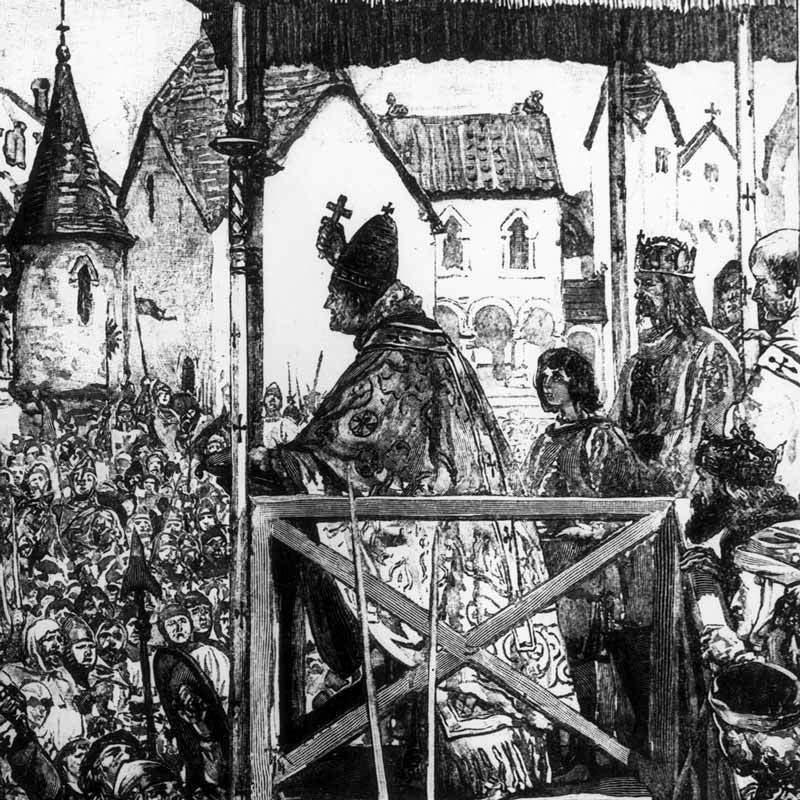 Pope Urban II preached his famous “Crusade sermon” on November 27 in 1095 after Council of Clermont calling all Christendom to unite and help the Byzantine Empire and fight off the Muslim invaders. And thus, the era of the Christian Crusaders had begun. First Crusade 1095: Papal decree gave “full penance” to those dying in combat. Seljik Turks were defeated by “catholic” crusaders. They also took back Jerusalem in 1099 and created the “Kingdom of Jerusalem.” Jews suffered immensely at the hands of crusaders. The decided anti-semitic tone of Pope Urban II’s “Crusade” sermon combined with the fact that not all Crusader soldiers were devout Christians but opportunistic mercenaries made for several massacres of Jewish settlements found en route to Jerusalem. Second Crusade 1147-1149: after some relative peace between Christians in Muslims, Turks invaded city of Edessa (approx. south of Turkey). French and German Christian armies came but were unsuccessful. 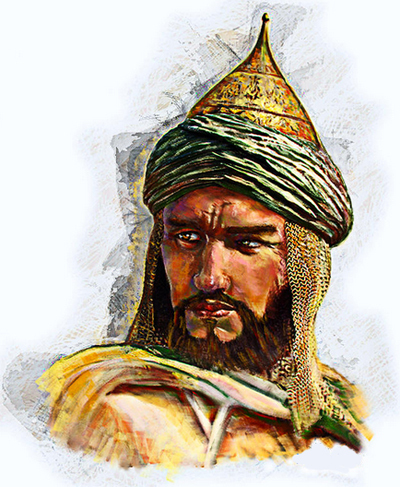 Third Crusade 1189 – 1192: In 1187, the famous Saladin re captured Jerusalem. French and British crusaders formed unstable alliance. They marched all the way to Jerusalem but Saladin had poisoned the wells on route as well as burned crops. A truce was signed between the Christians and Saladin’s muslims. NO victory for Christendom. Fourth Crusade 1202 – 1204: attempt to recapture Holy Land via Egypt. However, Venetians re routed the crusade to Constantinople in order to place a new Christian leader on the Byzantine throne. This crusade faltered and never made it to Jerusalem. Albigensian Crusade 1209 – 1229: Pope Innocent III tried to remove the Gnostic Cathars from the south of France. No muslim involvement. Children’s Crusade 1212: the veracity of this crusade has been questioned. Supposedly, thousands of German and French children marched towards Jerusalem in order to free it from the Muslim armies. Apparently none of them reached Jerusalem. They either starved en route or were captured as slaves. Fifth Crusade 1213-1221: Hungarian, Austrian and Bavarian crusaders attempted an Egyptian route to free Jerusalem. They got greedy and tried to capture Cairo but a Nile flooding turned them away. Sixth Crusade 1228: Emperor Frederick II negotiated a 10 year hold on Nazareth, Bethlehem and Jerusalem. Seventh Crusade 1248 – 1254: Jerusalem is back in Muslim hands due to Egyptian meddling. Louis IX attempted to sack Egypt. Failed. Eighth Crusade 1270: Louis IX tried to re conquer parts of Syria. Louis died and the crusade was a failure. Ninth Crusade 1271: the future king of England tried to take Syria but failed. Baltic and Central European Crusades (aka Northern Crusades) 1198-1290: mainly a German effort, it was a military attempt to subjugate the people of these regions to Christianity and its empire. During this clash of Muslim and Christian civilizations, Muslim science and architecture and military tactics were encountered and absorbed by Europeans. It should be no surprise that Muslims view the Crusades as Christian invasion. Christians view the Crusades as just retaliation for an apparently never ending expansion by Muslim armies. A forray which had advanced for over 400 years ever since the prophet Mohammed’s initiation of a Muslim raiding army which had, over the following decades and centuries, turned into multiple empire-building armies. The Crusades marked a definitive turning point in history for the relationship of Jews to the Catholics. Battles were very bloody throughout this clash of civilizations, and the Jews got caught in the middle. Jerusalem residents were massacred, Jew and Muslim alike. During the first crusade, unfortunately, due to tone of Pope Urban II’s sermon, many Jews were massacred as the Crusaders marched to Holy Land. This has been dubbed, the “first holocaust.” And the anti semitic tone from the Catholic Church unfortunately did not dissipate much over the next several hundred years. A major player in the crusades was the corporation known as the Knight’s Templar (1119-1312). It was comprised of a large financial network of wealthy supposed Christians who controlled a powerful banking system that lent money to monarchs and other large scale enterprises. Knight’s Templar was also comprised of a military branch of very skilled knights who were key players in the early Crusades. However, once Jerusalem was lost, they faded in popularity and importance. Eventually, Philip IV, King of France — who was deeply indebted to the order — started circulating rumours that the Templar was unhealthy (secret ceremonies, initiations, etc) and had them arrested, tortured and disbanded by 1312. Was the persecution justified or was King Philip IV just trying to save his financial hide? We will never know for sure. What muddies the waters is that the Freemason’s of the 1800’s adopted many Templar symbols and their shady initiation rites are claimed to mimic those of the Knight’s Templar. Yet this is unproven. It will perhaps be forever unknownable whether these Knight’s Templars were guilty of the crimes they were accused of. All in all, there were multiple factors that led the mostly Christianized european world to engage in the major military engagements now known as the Christian Crusades of the middle ages. Many different players were involved, each having a varying degree of purity in their motivation. What cannot be ignored however is the fact that there was more than enough reason to believe — both then and now — that the Muslim world had a world wide conquest in mind and were showing no signs of slowing their envelopping of the European continent.